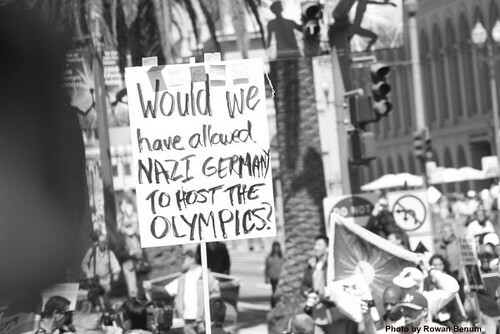 Why, yes, actually, we did “allow” Nazi Germany to host the Olympics back in 1936. Hitler even presided over some of the ceremonies. The sign is so wrong that at first I wondered whether it was a Photoshop job, but apparently it’s legit. I realize this photo is from around three week ago, but I didn’t see it until Ed pointed me to it yesterday. Given my interest in World War II history and the Holocaust, you just knew I couldn’t resist it once made aware of it. True, it’s not as hilariously dumb as Tony Zirkle, but it does reveal a shocking level of historical ignorance. It also waters down the legitimate protest against China’s treatment of Tibet.